Here's another in the series of hummingbirds I'm doing. 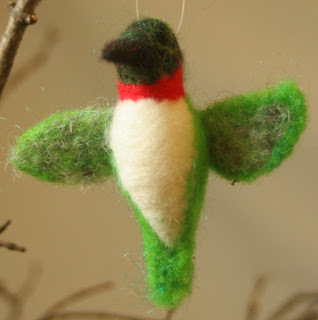 I made hummers last year, but with wings closed, and I didn't have any sparkly fiber. These are a lot more fun. I have to credit the boy, because he kept telling me that I needed to make hummers with open wings. It works with hummers because they are so small; with a larger bird I'd probably have to use an armature for the wing. I've done it, but I don't love armatures (wire framework). So, anyway, I like them this way, and I've pleased the boy, which counts for something!